Stock Car Racing at Yarmouth Stadium01493 720343work Motor RacingWhen it comes to sport which is fast & furious, Yarmouth Stadium is the place to be. Sited at Caister-on-Sea, Great Yarmouth, Norfolk, the stadium has developed over the years into a major venue. 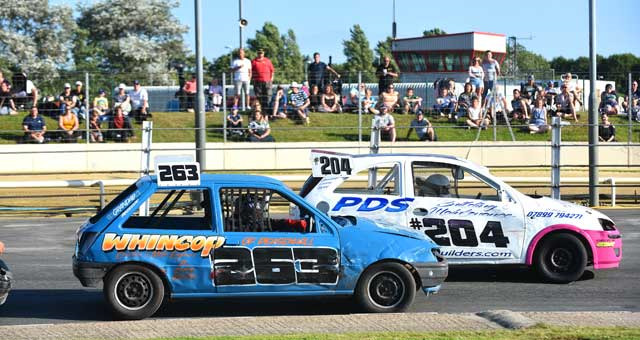 Join in the fun of stock car or banger racing on most Sunday evenings from mid-April to mid-September and mid-week in the summer season with Wednesday stock car action. (Please check for details). In November the stadium hosts a gala night with gigantic firework display and a Christmas spectacular event is held in December. 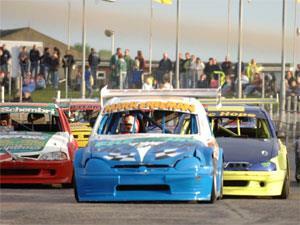 The stadium also hosts events in conjunction with Spedeworth International Motor Racing and throughout the year stages a variety of events ranging from hot rod and stock car to banger racing. We have three Raceview Bars, a Raceview Diner serving the best in bar food, a ground floor snack bar & amusement area, plus a fourth separate licensed bar so you can be sure to enjoy the racing while relaxing in a great atmosphere. The glass fronted upstairs bars overlook the racetrack giving you a clear view of the racing action. When it comes to sport which is fast & furious, Yarmouth Stadium is the place to be. Sited at Caister-on-Sea, Great Yarmouth, Norfolk, the stadium has developed over the years into a major venue. Smoking is permitted outside only. Corporate entertainment suites are available, please telephone for more details.